Is a two-speed BMX bike just too much? Pictures have surfaced recently (on BMXmania and Vintage BMX) of Barry Nobles running a 2-speed at the recent Chula Vista SX race. Granted, this isn’t the first time 2-speeds have been tried. Back in the 80s, the Browning 2-speed enjoyed some short-lived popularity but was quickly abandoned due to reliability issues. I’m not sure how I feel about this development. While it’s cool in a whiz-bang, “maybe it will work this time” kinda of way, it doesn’t feel like BMX to me. Maybe I’m becoming a curmudgeon in my old age. But isn’t part of the attraction of this sport the simplicity of the bikes? The race community has already adapted clips, if multi-speed bikes are next, are we just a few years from spandex skinsuits and paved tracks? ESPN ran a great post on the weekend featuring Jim C. from Sunday Bikes talking about Sunday’s philosophy on frame building and the reasons why they approach it the way that they do. It’s an in-depth look at how they work with their partners to create frames with innovative features like wave tubing, hollow dropouts with twice the strength of regular dropouts and their famous 41 thermal treatment that helps keep the frame light but yet incredibly strong. There’s tons more in the article, so be sure to check it out here. Less than a decade ago, if you were looking for serious, non-race 24″ cruiser your choices were few and far between. If you wanted a 24″ bike that would take some abuse, it usually meant you were riding either a Haro Backtrail 24 or the DK General Lee. Today, you may have noticed (especially if you’re a regular reader of this site) that the choices for non-race 24″ cruisers are a little deeper. And perhaps fittingly, those two old workhorses, the Backtrail and the General Lee were dropped from their respective company’s lineups. But just like those ol’ Duke Boys in a car chase with Roscoe P. Coltrane, the General Lee was a bike that couldn’t be kept down. It’s resurfaced, albeit in a slightly different incarnation and to some sometimes heated BMX forum discussion in, of all places, Walmart! Do Bo and Luke Duke know what happened to the General Lee? Word on the street is that Huffy bought out DK and, in addition to their higher-end bikes and parts, they are offering a small lineup of race and freestyle bikes in Walmart. This version of the General Lee is hi-ten steel with Chro-mo 3-piece cranks…a far cry of it’s original completely Chro-mo version…but priced accordingly, at $179 (US). Some people are burning up the forums saying this is a travesty. I dunno. Remember the Subrosa Salvador 24 from last year? That was a hi-ten bike with chro-mo cranks priced at $404! That to me, was more of an outrage. At least this bike is priced appropriately and sold in a place that makes sense. I can see a Dad picking one of these up, at the same time he’s picking out a first bike for his son or daughter. Who knows, after jumping curb cuts, popping a few wheelies and just having fun on his $179 bike, he’ll decide to upgrade to something a little better at his local bike shop. And there he’ll see a brand he recognizes but be something much better suited to heavy-duty riding. What do you think about DK bikes showing up at Walmart? For complete specs, check out Walmart’s page. For more info on all the Dukes of Hazzard references in this post, click here. Lots of Sunday news in the past couple weeks, it’s hard to know where to begin. 1) Sunday recently debuted the 2012 version of their popular Model-C complete. Off the top, I’m pretty stoked on the refinements to the frame geometry. They’ve increased the top tube length to 22″ (yes!) and tightened the rear end to 14.625″. Lots of people have been asking for a longer top tube on the complete, so it’s great to see it finally becoming available. Parts- wise, you can’t complain either. Odyssey parts including Quadrant rims, Mike Aitken tires, Monolever, and Twisted PC pedals are all standard on this bike. Throw in Sunday parts like the Sabretooth sprocket and Freeze stem and you’ve got one good-looking complete. Check out Jim C. shredding this Austin ditch on the new complete for proof that this bike is no slouch. 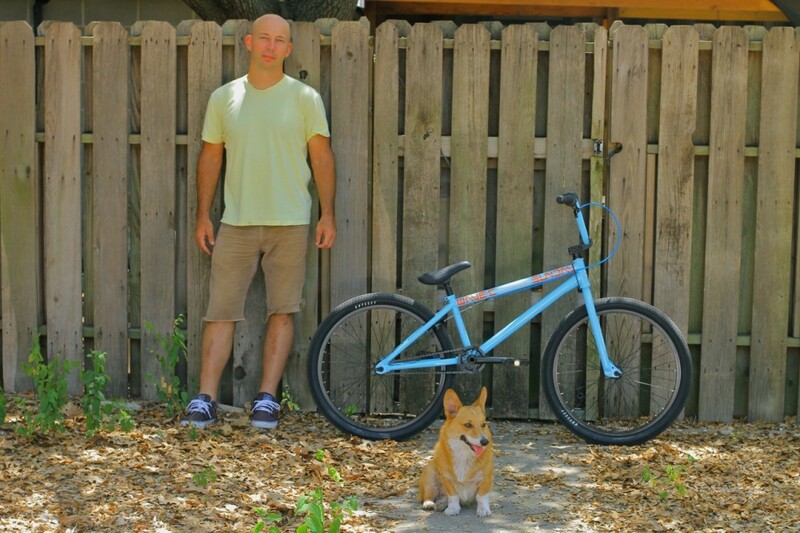 2) Sunday also recently posted a bike check of Jim’s recently built up Vapor Blue Wave-C. This is one sweet looking ride! It’s loaded with Sunday and Odyssey components and gives you a good idea of what a high-end, custom-built 24″ Sunday might look like (and also how deep the Odyssey and Sunday product lines are). Check it out here. The guard dog named Monty is a nice touch too….gotta get me one of those. 3) If you’re an eagle-eyed reader, you may have noticed that both the Model-C complete and Jim C’s personal ride are sporting the new Sunday Freeze stem. It’s no coincidence. Jim Cielencki and Alex Magallan have been using the Freeze stem since February. Feature-wise, the stem’s top cap is a 6061-T6 aluminum forging (for additional reinforcement in the bar clamping area) with a cast aluminum body. It has a 34mm rise (to maximize bar height) and a length of 52mm. This is a good-looking stem. That’s all well and good but I have you seen what the price is on this stem? $29.95! 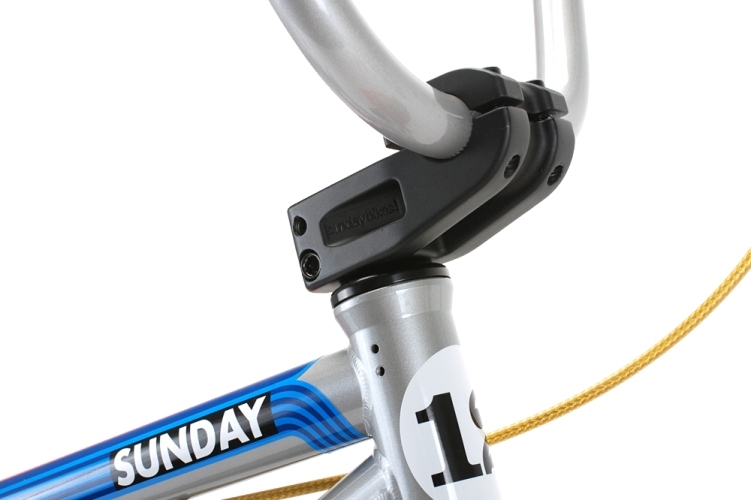 For a stem that can hold up to all the abuse Jim C. and other Sunday team riders can throw at it. That got my attention immediately. If you’re in the market for a top-load stem, this should probably be on your short-list of choices. While we’ve featured (really) old guys who ride before, by and large they’ve been racers. Are the freestyle/park guys going to be able to hang when they start hitting 50? Well, it looks likes I got my answer. 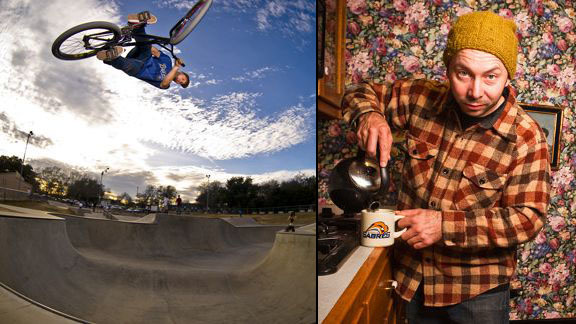 Check out this park rider, pushing 60, and still out there getting rad! Back in the 90s, Bobby Fisher made a name for himself with a style of riding that combined the technical aspects of flatland with a creative street element that was awesome to watch. A regular in videos and magazines of that era, Bobby has now slipped out of the limelight for the most part. Bobby’s still going strong though. ESPN recently caught up with him and found out that he’s still riding but now balancing that with running the family tire business and other aspects of day-to-day life. What’s interesting though is that Bobby’s made the jump to a 24inch bike, specifically the Sunday Model-C. The transition was actually easy. The Model C feels just like a 20-inch but with bigger wheels. I commute by bike quite a bit so I was stoked to be able to ride BMX more often. But Bobby’s doing more than just commuting. As these pictures from ESPN show, Bobby is still tearing things up. Whether it’s running the family business or sticking with the types of riding most fun to him (and what made him famous) Bobby has stayed true to his roots. It’s great to see that Bobby has managed to keep his love for BMX going despite all his other responsibilities. And now that he’s doing it on a 24″ bike, I couldn’t be more stoked. **If you’re not familar with Bobby Fisher, check out this clip from Style Cats back when Bobby was a key part of the Standard army. No doubt this cat’s got style. Spotted this sweet pumptrack vid on a VintageBMX thread today. Talk about an awesome setup! Word has it that these tracks are popping up all over the UK….and they’re paid for by the local city councils! Not only that, you can get a decent cup of tea there too…maybe it’s time for a visit.